Get ready, because Furby Boom is the beginning of another adventure. A new generation is hatching on the free Furby Boom app. Discover everything that only Furby Boom can do. With the Furby Boom app, Furby Boom can remember and say its name, remember the names of Furby Boom friends it meets, collect and hatch virtual eggs, and raise a city of virtual Furby Furblings. The Furby Boom experience combines real-world interactions with virtual play for a game that will keep you coming back for more. Your Furby Boom responds to you, changes personalities based on how you treat it, dances to music, talks to other Furby Boom creatures and virtual Furby Furblings creatures, and more than anything, wants to connect with you! 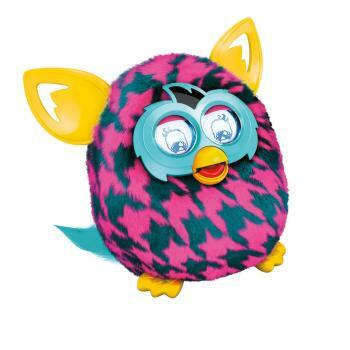 The population is booming because Furby Boom can hatch more than 50 virtual Furby Furblings eggs! Collect virtual eggs in the free Furby Boom app by taking care of your Furby Boom, getting them from friends with Furby Boom, and even by finding them. Can you hatch enough virtual Furblings to fill the towers of your city and get the golden egg? As you collect and hatch virtual Furblings eggs, your digital city fills up with virtual Furblings that you and your Furby Boom can interact with.Team up with your Furby Boom and your virtual Furblings to play games in the app such as Furball, the Furbish version of soccer. Between taking care of your Furby Boom and raising virtual Furblings, the Furbish fun goes on and on! Furby Boom has a mind of its own and combines physical and digital ways to play. Interact with your Furby Boom 1-on-1 to shape its personality, and then hatch and raise digital Furby Furblings together in the Furby Boom app. Furby Boom is different. This Furby Boom creature has more than twice as many responses as the previous Furby, remembers the name you give it, has 5 new personalities to discover and, on top of all that, it’s hatching a new generation! Be the first to review “Furby Boom (Purple Houndstooth)” Click here to cancel reply.